Composite resin is a white “plastic” material that is used to restore teeth. The material can be closely matched to the natural colour of teeth, so the restorations are nearly undetectable. The resin compound naturally bonds to the tooth, thus the seal is “tight”. Tooth preparations are more conservative than with amalgam (silver) restorations because less tooth structure is removed for mechanical retention or the restoration. The material is directly bonded to the enamel or dentin of the tooth. This restoration is ideal for small chipped/ fractured areas, small pitted decayed areas that do not require much tooth removal. 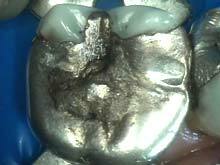 However, it is not a material of choice for longer and deeper restorations. 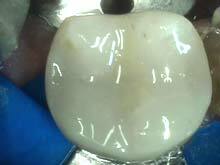 Inlays/Onlays/crowns in porcelain or gold are better indicated. The longevity is usually 5-10 years. Please eat nothing until the numbness wears off. Be careful not to bite your lip, cheek or tongue during this time. Please stay on a soft diet and eat on the opposite side of the treated area if possible. There may be sensitivity to biting. If you feel that you are biting on the filling early or biting on the tooth early, please call us so that we may adjust it for you. There may initially be sensitivity to temperatures especially to cold. The sensitivity can last for roughly 1-4 weeks, depending on the amount of decay that was present in the tooth or the depth of the previous restoration. Deep areas of decay that are close to the nerve or pulp of the teeth and are restored with a large filling may be sensitive. Every effort is made to avoid a root canal by placing desensitizing medications under these fillings. If the nerves of these teeth were unhealthy, the teeth may become more sensitive. If the sensitivity increases or persists over time, please do not hesitate to contact our office. There may be some tenderness around the gum line or at the injection site. Please mix tbsp. of salt with an 8 oz. glass of warm water. Rinse your mouth several times a day the first few days after treatment if needed.